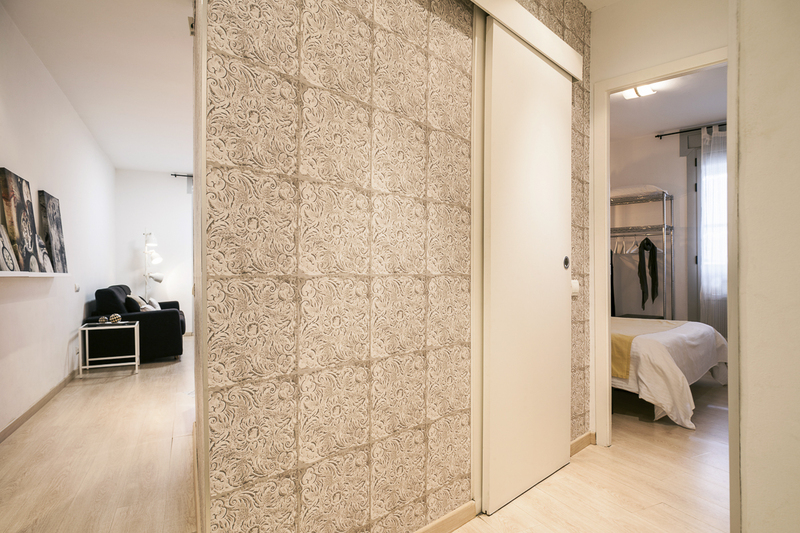 The Pelai C (HUTB-002683) apartment in Barcelona is found on the fourth floor of a spectacular Eixample building with a lift. 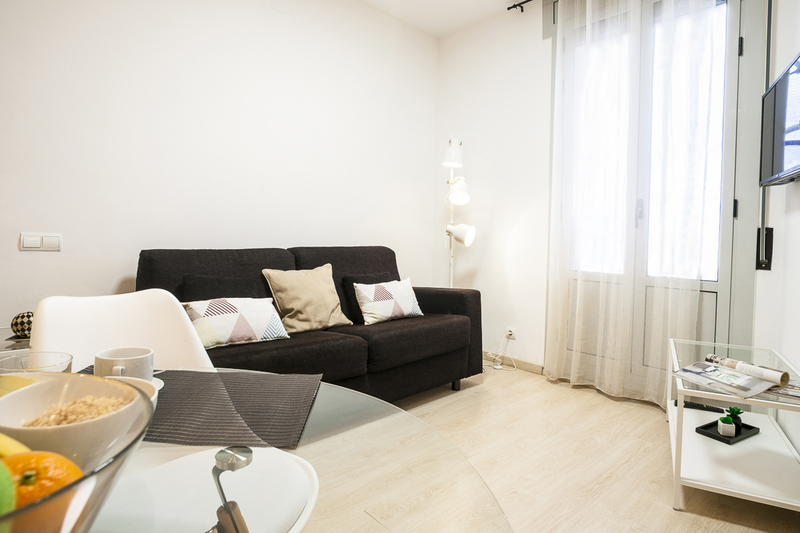 Just a stone’s throw from Las Ramblas and Plaça Catalunya the apartment enjoys some incredible views over Barcelona’s highly cosmopolitan city centre. This apartment was completely refurbished in 2010 and stylishly and practically decorated in neutral grey and white scheme with some red accents. 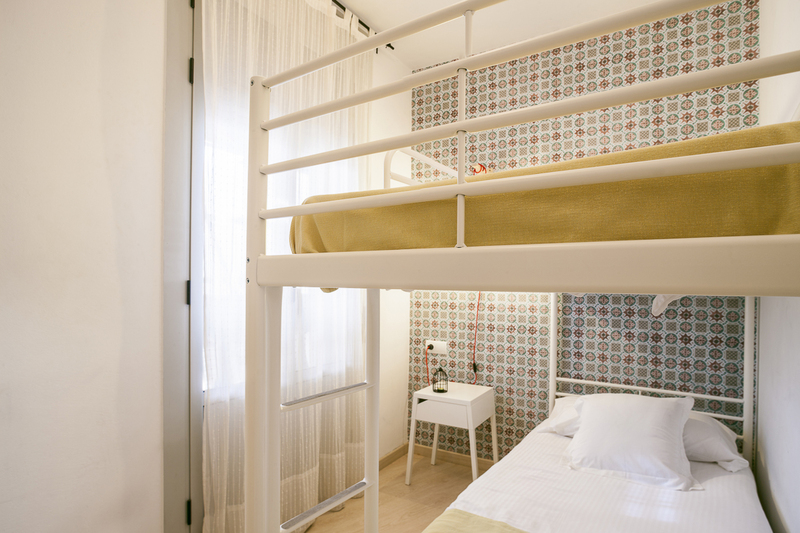 There are two double bedrooms, one with a double bed and the other with a generously sized bunk bed. 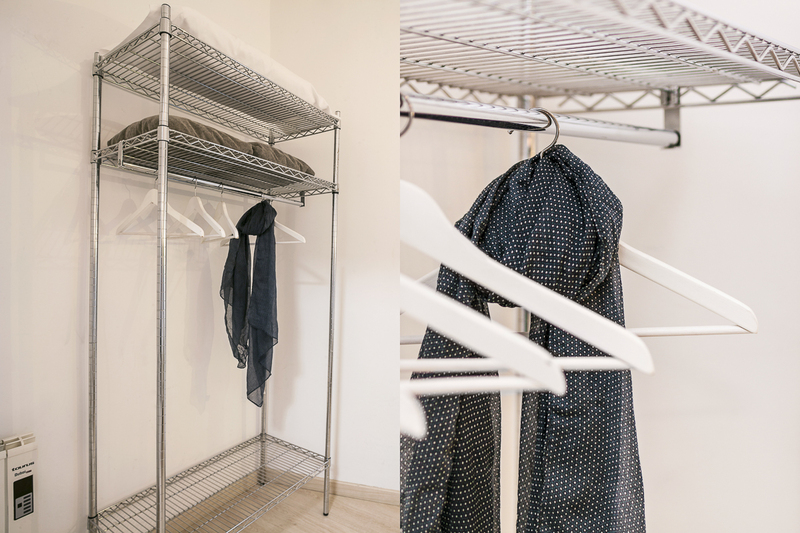 Both bedrooms are a good size and feature wardrobes and double doors opening onto a mini balcony over the street, making them exceptionally light. 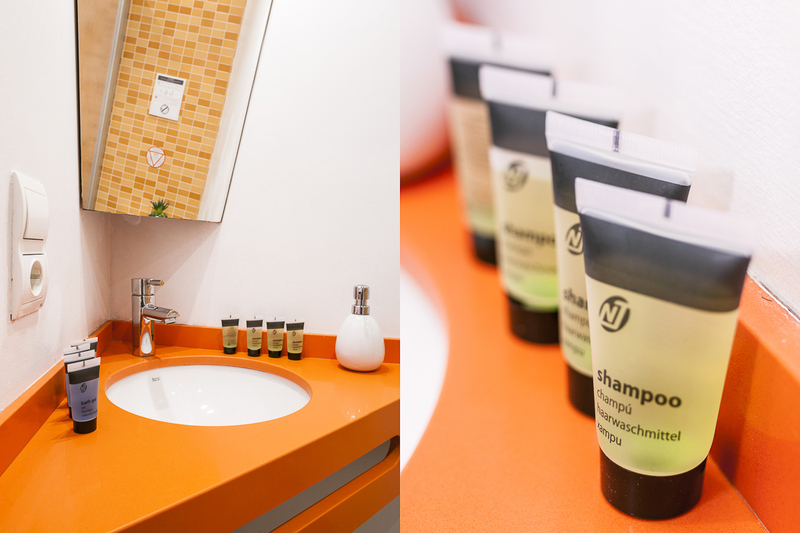 The bathroom is small but perfectly equipped. 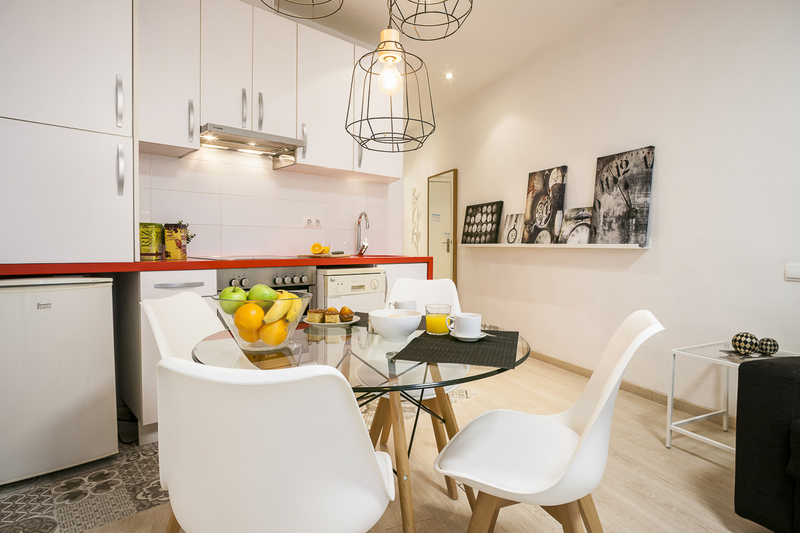 The living and dining room shares space with a modern office kitchen that is equipped with a ceramic hob, oven, dishwasher, microwave and all the utensils and crockery you need to prepare a meal. 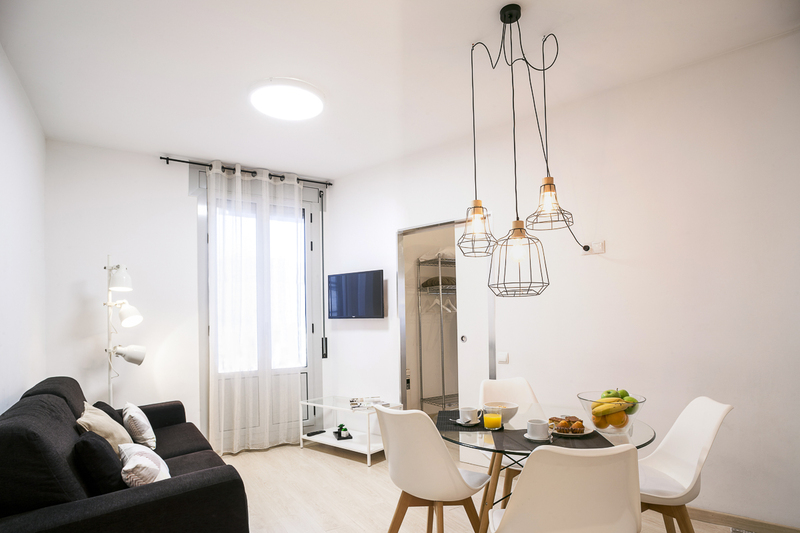 The dining area features a table and four chairs and the living area features a comfortable sofa bed. Other features of note include a free Wi-Fi connection. 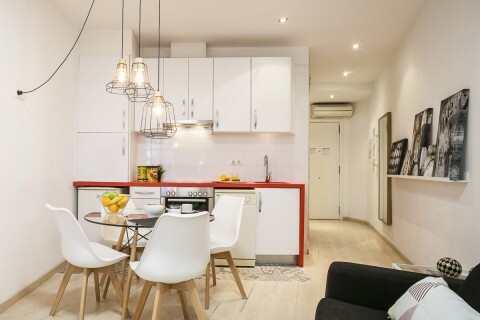 This apartment can be rented in tandem with the apartment opposite which has similar characteristics and size. 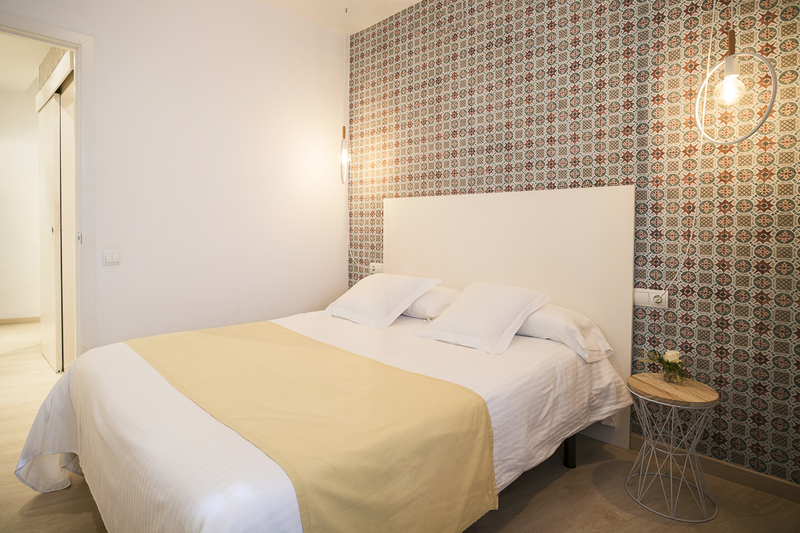 To resume, this is a new apartment that is fully equipped and located in one of the best areas of the city, in the tourist centre of Barcelona. shoe shops photography and electronic equipment, bars and restaurants, etc., making the place a strategic enclave for shopping all locals and all visitors to the city. 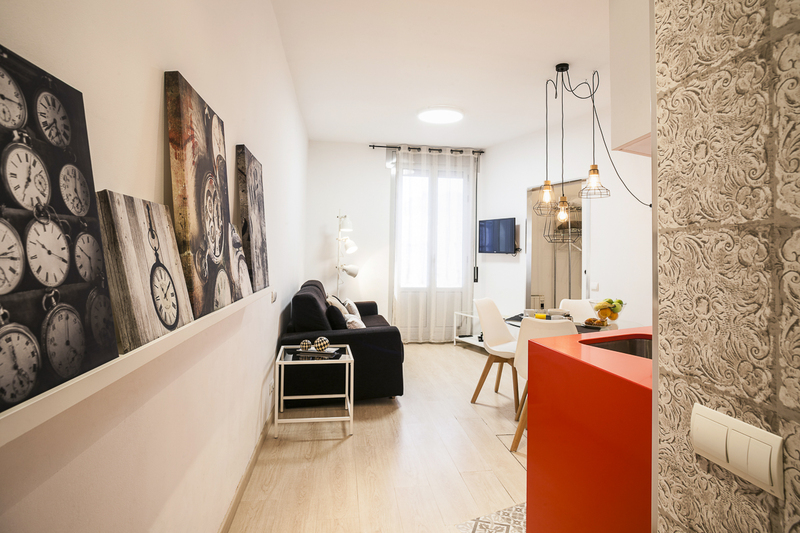 As for public transport, this apartment could not be in a better place, being equidistant between Catalunya metro (Line 1 and Line 3) and Universitat (Line 1 and Line 2) and with an enormous number of day buses, night buses, tourist buses and a Ferrocaril (urban railway) station too. Su comodidad, su mobiliario moderno y sobre todo la ubicación, cercano a lugares de nuestro interés, nos ecantó la decoración, nos sentimos como en casa... maravilloso!!! 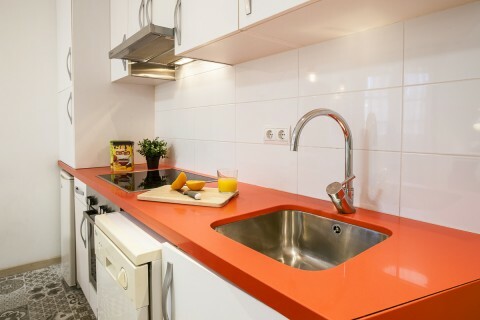 El apartamento en general, la vista, la ubicación, el equipamiento para cocinar, la cálida bienvenida de María, y su buena predisposición para ayudarnos. 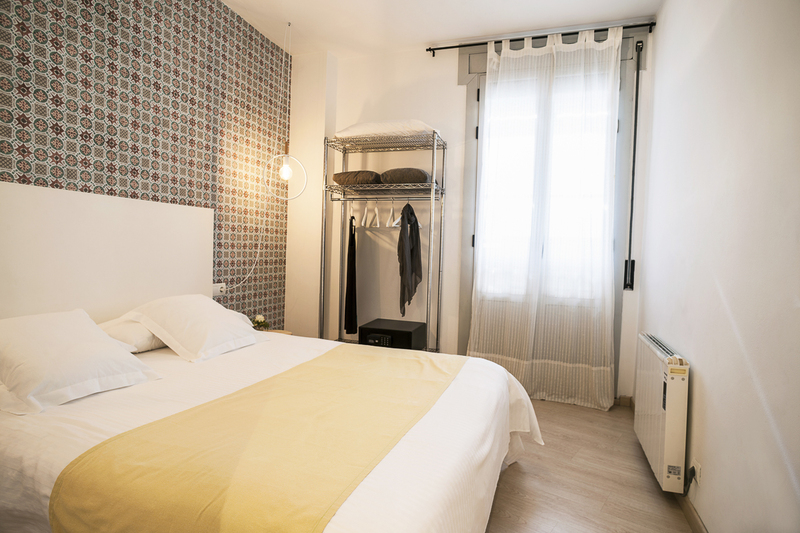 The location is perfect, near two metro stops, lots of restaurants and Plaça Catalunya. I like the furnishing style and that is not someones everyday home. The safe is a nice touch. Host are very responsive and pleasant. La situación en la ciudad, la seguridad, todo listo cuando llegas..
apt. was great and if we ever come back we will definitely book one apartment with you. Thank you! Excelente ubicación y comodidad, Amplio, completo y bien decorado. Si vuelvo a Barcelona no dudo en regresar a éste apartmento. Nos encantó! The location is great!!! The apartment is sweet, can fit for up to 4 persons perfectly. The reservation process was quick and i got answers to all my questions! Great location. Private and safe building. Location. The apartment and area felt totally safe. Accessible to everywhere - supermarkets, metro stations, taxi stand, shops. The apartment was a good size too & had amazing views. The building is very charming and the receptionist was friendly. The location of this apartment is wonderful.